Our employee of the month for August is Patryjca Kaminska. 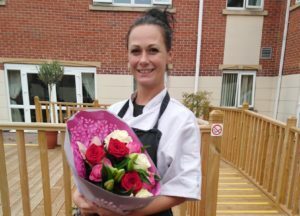 Patryjca joined Bunkers Hill Care Home in July 2015 as a Social Care Worker. With her unique personality, she soon became a favourite with her fellow staff, visitors and most importantly, our residents. In August of this year, Patryjca became a part of our kitchen team. She has quickly settled in to her new role and with her usual hard work and perseverance, has become an essential part of our kitchen team. We wish her all the best for the future.